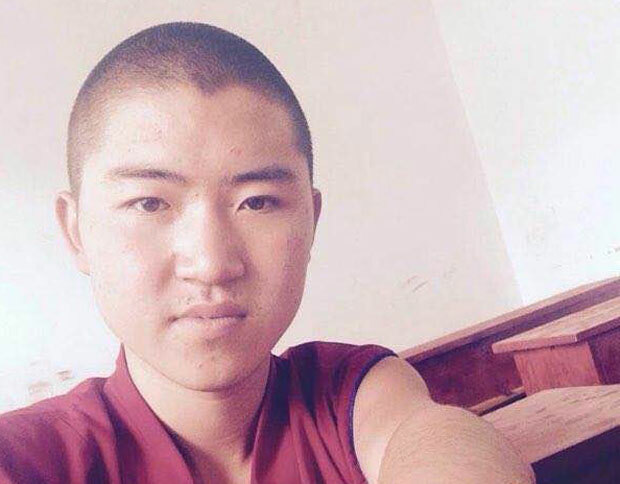 (TibetanReview.net, May20, 2016) – Chinese police in Tawu (Chinese: Daofu) County of Karze (Ganzi) prefecture, Sichuan Province, had arrested on May 16 a young Tibetan Buddhist monk without giving any reason. However, various Tibet-related overseas news reports say the monk, named Jampa Gelek, was seen photographed in front of a Tibetan national flag and was also suspected to have planned to carry out a protest self-immolation. The report said the 23-year-old first-year student at the Tawu Institute of Buddhist Studies of the Nyitso Monastery was held while carrying out a religious walk around a stupa near his monastery at around 8:30 pm. The monk was reported to have been taken to a prefecture-level police detention centre in Dartsedo (Kangding) County. The reports did not state how the Chinese police learnt about monk’s plan and action before arresting him. The photograph was reported to have been taken in his room while the monk was said to have disclosed his plan to immolate himself last year as a protest against Chinese rule in Tibetan areas. His family reportedly stopped him from carrying out his plan. However, after taking him away, they were reported to have searched his room to also find a Free Tibet slogan in English written on a wall.